Although Taylor Lautner has become a star not so long ago, thousands of hundreds of fans adore the actor today. The majority of them are women: Taylor Lautner is handsome and attractive. Lautner got recognition after The Twilight Saga about vampires. Today, there are some works in his filmography that show his talent as brightly as the role of Jacob Black. Taylor Lautner was born in February 1992 in Grand Rapids, Michigan. The would-be actor had diverse roots: German, French, Dutch, and even Indian, namely, Ottawa and Potawatomi). Taylor has a younger sister, Makena. The boy’s parents, Deborah and Daniel Lautner, had nothing to do with arts; they only wanted their son to grow up healthy and athletic. Thus, the father took six-year-old Taylor to a martial arts club. Lautner was fond of karate and stood up among his peers for his sports achievements. 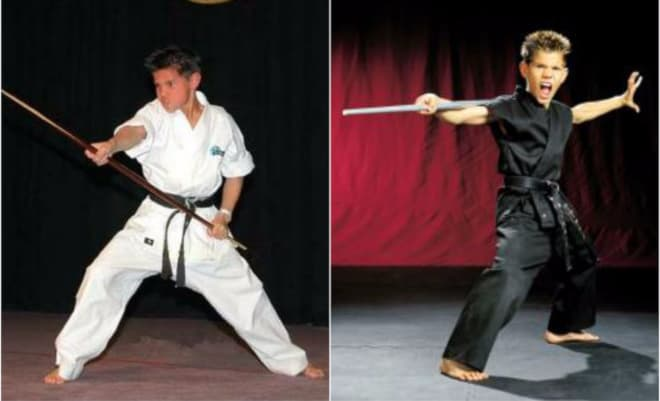 At the age of seven, the boy won a tournament in his category and was sent to represent his country in the international competition. At this period, he thought about acting for the first time. The boy’s coach saw that Taylor’s abilities were not limited to acting, and his future could be more exciting. As soon as he heard about the casting to Burger King commercial, the man insisted that Lautner should try himself. The auditions were not successful: the boy had no acting experience. Nevertheless, the combative spirit was present: Taylor did not stop halfway. His ego was hurt; Lautner decided he would clear this height. The parents supported his sports enthusiasm and accompanied their kid to many castings in Florida where the opportunities were much more diverse than in Michigan. Simultaneously, Taylor continued to develop his sports skills. To achieve better results, he joined the club of legendary Michael Chaturantabut, the sevenfold champion of the United States. At 12, the teenager became a world junior championship winner. Overall, the home collection of prizes and awards took pretty much place. 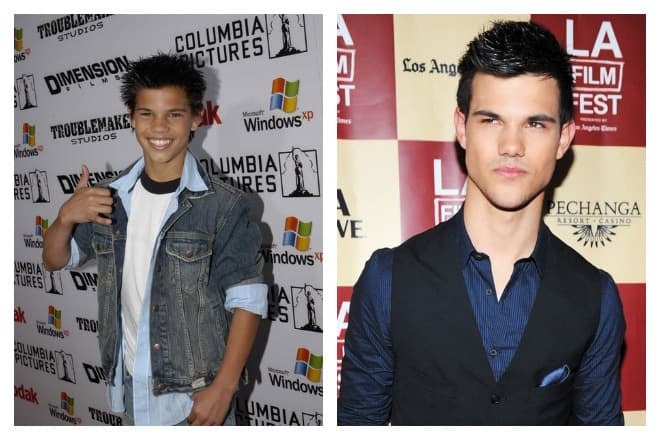 Lautner became a handsome young man with a bright, memorable appearance. The future Hollywood star managed to achieve his childhood goal at nine: he got an episodic role in the comedy series My Wife and Kids (2001). The accomplishments inspired the actor, and the family moved to Los Angeles for the sake of Taylor’s career: they wanted the boy to have as many opportunities as possible. From that time, Lautner frequented castings and auditions and soon succeeded. Several months after the debut, the boy was offered several roles in movies. The young talent participated in the witty comedy The Bernie Mac Show; the bright part in the adventure movie Shadow Fury followed. The next year, the actor tried voicing animated movies: the characters of What's New, Scooby-Doo?, Duck Dodgers, and Danny Phantom got his voice. Taylor did not forget that acting required learning: he attended drama classes and eagerly absorbed the new knowledge. The success came fast. In 2005, the teenager was offered a role in the movie The Adventures of Sharkboy and Lavagirl in 3-D. The young man had the chance to apply his sports skills to practice. Critics and ordinary people welcomed the project, and the 13-year-old artist felt what fame was like: fans recognized him in the street and asked autographs. More than that, Taylor did not have to go to dozens of castings to get a new part: directors themselves invited him. 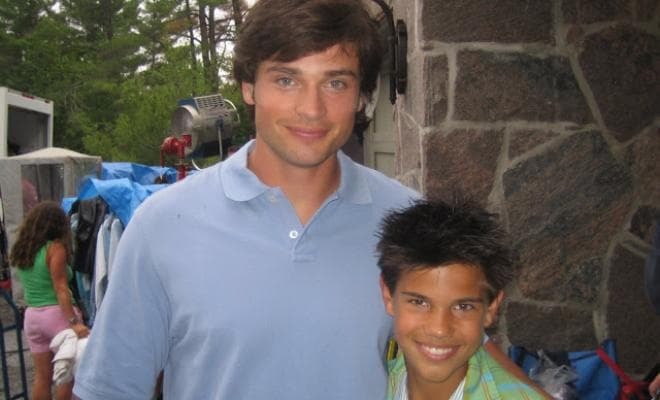 Lautner’s biography was expanding quickly: the series Love, Inc. and the family comedy Cheaper by the Dozen 2. He continued to work as a voice artist and participated in He's a Bully, Charlie Brown. The two-year break followed: Lautner had to study. In 2008, he came back to cinematography triumphantly: the actor starred in the movie hit Twilight. 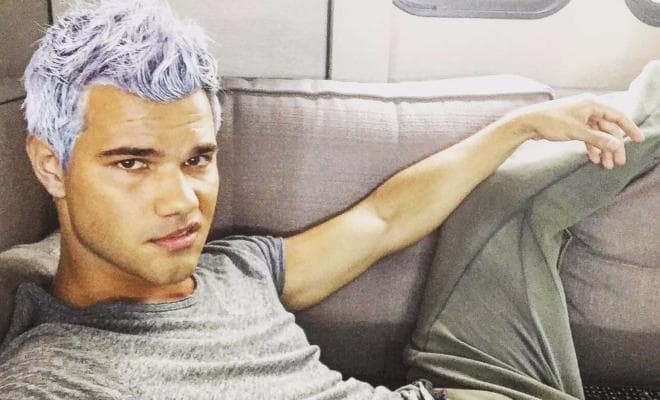 To receive the role of the werewolf Jacob Black, Taylor put on some weight and gain muscle mass: according to the story, Jacob could not be fragile and thin, and directors wanted an artist with a strong, sculpted torso. Lautner longed for this role: it promised to be starring. He went to the gym and solarium for several months and consumed special protein cocktails. As a result, Taylor put on 33 lbs. (15 kg.) in a while. The movie shooting was challenging: in addition to nutrition changes and regular grueling exercise, the young man had to wear a cumbersome wig. However, the endeavor was worth it: millions of viewers watched Twilight, and the actor found himself famous. Many fan clubs appeared in Europe, Asia, and America; girls were following him everywhere. One of them was so over-excited that committed suicide and said she could not live without Taylor. There were also rumors about the artist’s death on the Internet: allegedly, he could not stand the busy schedule, took drugs to relax, and died of an overdose. Lautner was surprised to hear that: the actor had always led a healthy lifestyle. Later on, the new parts of the popular project were created: The Twilight Saga: New Moon, The Twilight Saga: Eclipse, and The Twilight Saga: Breaking Dawn – Part 1 & 2. In the last movie, the young actress Mackenzie Foy. According to Taylor, he felt uncomfortable to picture romantic feelings to the young character; however, their collaboration looked harmonious thanks to the actors’ talent. Movie critics did not appreciate Lautner’s effort, though: in 2013, he got Golden Raspberry Awards - Worst Supporting Actor. Despite this unpleasant experience, Lautner’s popularity and earnings were only increasing. In 2010-2011, the young man starred in several popular projects including the comedy Valentine’s Day and the action movie Abduction; the latter movie brought the actor the lead role. In the action thriller Tracers, Taylor personified a bike messenger Cam who interfered with two drug dealers’ business. As he was hiding from the criminals, the young man met a girl fond of parkour. The movies The Ridiculous 6 and Scream Queens (2016) are the actor’s recent works. For the latter project, Taylor had his hair dyed purple and posted a photo on his Instagram page. In 2016, the actor personified the main character, Reymond, in the drama Run the Tide. As the story runs, the young man’s mother is imprisoned, and Reymond adopts his younger brother. Many people are interested in Taylor Lautner’s personal life; paparazzi and intrusive fans follow every step of the actor, and each short-term romance is immediately discussed in the media. The athletic actor became famous as a womanizer. Lautner dated Selena Gomez, Kristen Stewart, and Taylor Swift. The country singer and the actor started seeing each other in 2009 and appeared in the comedy Valentine’s Day together. At some point, the couple decided to break up; Swift created the song “Back to December” as a good-bye gift to the ex-boyfriend. The same year, Lautner was noticed with Selena Gomez. However, it was a short-term affair that ended soon; the couple remained friends. The romances with Lily Collins, Maika Monroe, and Marie Avgeropoulos followed. There was much attention to Lily Collins and Taylor Lautner: the couple often went out together and looked happy. However, they split up. Rumors had it the woman wanted Lautner to talk about their relationship officially, but he took his time and remained silent. Finally, Collins realized she could not have a stable relationship with the heartbreaker, and everything ended. Soon, Lautner met Marie Avgeropoulos, and they spent two years together; in 2015, they broke up. Taylor Lautner and Robert Pattinson’s kiss provoked much noise. It happened during the MTV Movie Awards ceremony. Fans were confused: the artists were known to be heterosexual. It was Pattinson who initiated the kiss. Lautner looked at loss, but he did not resist. In 2016, another beauty, the actress Billie Catherine Lourd, became Taylor’s boyfriend. The young people were colleagues in the series Scream Queens; they spent together less than a year. At the end of 2017, the actor was seen with Olivia Holt: the couple visited a Christmas mass in a church in Los Angeles and attended a party. However, the actor celebrated the New Year with his family. The actor is attached to his family. Even when Lautner became a Twilight star, he continued to live in his parents’ house. The young man shares the household chores: washing dishes, taking away rubbish, and mowing the lawns. Taylor does not mind: these activities give him the chance to feel like an ordinary person. In 2018, Lautner’s younger sister had heart surgery: the actor wrote that on his Instagram. Makena had tachycardia that could be treated only by surgery. Nowadays, Taylor is less active than before: 2017 was marked with a standstill, and some fans said that the actor might not come back. The man put on some weight and lost the athletic shape that he used to have in Twilight. In 2018, the filming of the fourth and fifth seasons of the popular series Cuckoo started; Taylor’s role is quite significant. There are many photos of the actor with his colleague Greg Davies in social networks.